Food and Fuel America.com: What's Orange and Green and Goes to College? What's Orange and Green and Goes to College? Well it might just be Sebastian, the University of Miami mascot riding the Soy-based "Hurry"Cane shuttle buses on campus. In a continuing effort to become more environmentally friendly the University of Miami is launching a program to use soy-based biodiesel fuel in its ‘Hurry’Cane shuttle fleet. 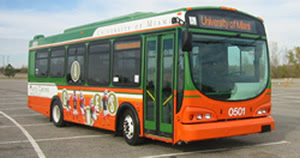 During the pilot program, which will run through the 2007 fall semester, nine of the 17 ‘Hurry’Cane shuttle buses will operate on B20 soy-based biodiesel fuel. The university has a goal to be climate neutral in the next ten years. And using renewable fuels is one step the university is taking to do its part. Biodiesel fuel is produced domestically using soy, vegetable oil, animal fats or even recycled restaurant grease.